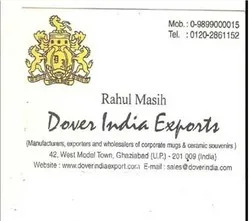 We Dover India Exports are one of the leading manufacturers and exporters offering a wide range of Promotional Mugs made from Ceramic Stoneware and Bone China. Our range include promotional coffee mugs, personalized ceramic mugs, printed ceramic mugs, stoneware mug with spoon, bone china coffee mugs, company logo printed mugs and promotional gift mugs, which are available in a variety of styles and colors. We also produce designer mugs, innovative mugs and unconventional mugs for our clients. We have made products for Archies, IIFA (India International Filmfare Awards), Amway-India, Aditya Birla, TATA Coffee, United Nations DP, Wipro, Microsoft, Raymond, HCL, Airtel, Vodafone, BHEL, Samsung, Cairn, Lays, St. Stephen's College-Delhi, American Airlines and Ranbaxy to name a few. Apart from this, our mugs are exported to large number of overseas countries including UK, USA, Jordan, Sri Lanka, UAE, South Africa and many more. Established at Ghaziabad (Uttar Pradesh, India), we are being efficiently led under the dynamic leadership of our director “Mr. Rahul Masih”. 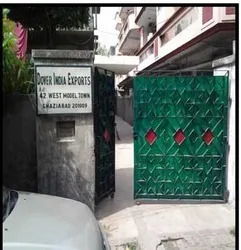 His over a decade of rich experience in the ceramic industry and support of experienced industry professionals assist us in delivering end products as per international quality standards. We are a quality conscious concern and ensure that cups, mugs and other associated products offered by us are made using best quality raw materials like clay, ceramic, bone china, and others. We offer a wide range of stylish, promotional and corporate coffee mugs and tea mugs, that help us in consistently meeting the specific needs of our clients. Apart from our range of promotional mugs, ceramic mugs, ceramic plates, promotional bone china mugs, etc, we can also develop the mugs in various trendy designs in accordance with clients' bulk orders. Our mugs are offered in different shapes & sizes ie; 90ml / 120 ml/ 150ml / 180 ml / 210 ml / 240 ml 270ml / 330 ml / 360 ml / 450 ml ( 3 Oz to 15 Oz ). These promotional mugs are attractive and affordable for sales promotion and corporate gifting purposes. Our range of mugs and other products are extensively used for promotional and gifting purposes. We have the capability and expertise in manufacturing them in customized finishes and artwork as per the promotional needs of our clients. Our talented team of artisans and allied workforce also have specialization in producing designs as per the shape and artworks needed by our Indian or overseas clients. We ensure that the customized mugs and allied products made for the overseas clients are not introduced in the domestic markets,thus preventing their imitation and also preserving the exclusivity of the product. We strive hard towards our goal of making the best quality mugs, which successfully cater to the varied requirements of our clients. Our innovative production techniques help us in offering our wide range of products at competitive prices. Further their attractive designs and low price tags leave the scope of high profit margins for our clients. Our extensive industry experience and collective expertise of our team also allows us to offer them in customized finishes as desired by our clients. We provide customization in terms of sizes, colors, designs, shapes, material and in other aspects. Our Team Our team of skilled and dedicated employees dedicated work towards the unified goal of producing mugs and allied products that meet the requirements of our clients. Their close contact with the market aids us in understanding the emerging market demands and futuristic trends. This enables us to bring necessary changes in our collection, helping us gain competitive edge in the national and international markets. We have developed our expertise in manufacturing products as per the customized specifications provided by our customers. Our skilled workforce assists us in understanding and meeting the size, designs and other specific finish requirements. Our clients can have any Logo/ artwork over the mugs. The artwork can be on one side, two sides or all over the mug, which we call a carpet design. The colors used by us are 100% microwave safe. Our expertise in delivering a wide range of Promotional Mugs & other customized ceramic stoneware products has helped us to gain a large clientèle base all over the world. Appreciated for their aesthetic finish and exclusive designs, our range of handcrafted and machine made mugs, cups and other products has also helped us in establishing a strong client base in both the national and international markets. We have made products for Archies, IIFA (India International Filmfare Awards), Amway-India, Aditya Birla Group, TATA Coffee, United Nations DP, Wipro, Microsoft, Raymond, HCL, Airtel, Vodafone, BHEL, Samsung, Lays, St. Stephen's College, American Airlines, Ranbaxy to name a few apart from exporting our promotional mugs to clients in the UK, USA, Jordan, Sri Lanka, UAE, South Africa and other countries. Our extensive industry experience and collective expertise of our team also allows us to offer them in customized finishes as desired by our clients. We provide customization in terms of sizes, colors, designs, shapes, material and in other aspects.